Need to find Santa? Who you gonna call? How about NORAD? Since 1955, the aerospace defense organization has been tracking Jolly Saint Nick as he darts around the globe to deliver presents before children wake up on Christmas morning. The tradition actually started by mistake. A department store ad posted in a local paper had provided a phone number where children could call up Santa. However, thanks to a misprint, children ended up calling NORAD instead. NORAD staff stayed up all night answering the calls of eager children looking to speak to Santa, and it's been a tradition ever since. 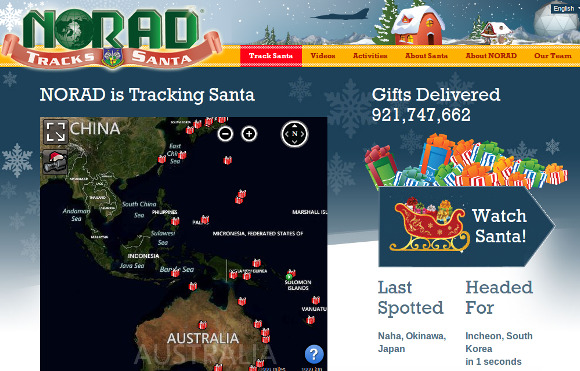 Today, children can track Santa's progress on Twitter and on NORAD's website in addition to giving Santa's trackers a call.